Our flagship store at 31 Western Road Lewes. Pure botanical skincare at its best - a few of our products for the face. The full range of our products are available for you to test and buy and we’re happy to advise on which cleansing, toning and moisturising ritual is the right one for you. In addition to our own skincare, we have commissioned some of our fine friends to supply us with a few limited edition exquisite pieces made using, or inspired by our plants. You’ll also find products that are only in the shop and not available on the website. All new releases will preview in the shop. 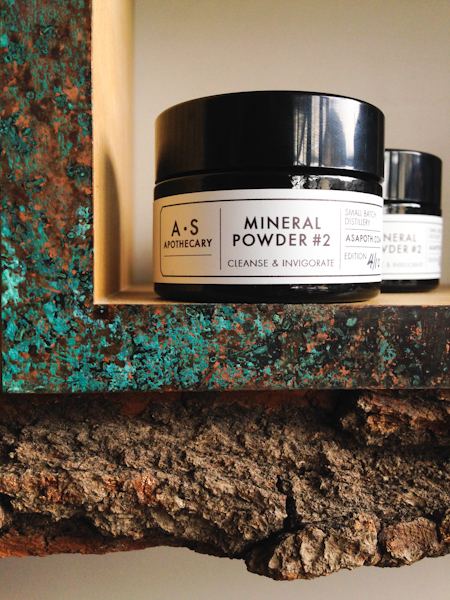 Mineral powder for the mildest exfoliation. A bespoke massage or facial are the perfect way to experience our products. We now have tranquil treatment room with many excellent therapists offering the signature A.S Apothecary facial, massage and acupuncture. The treatment room is open Friday to Sunday every week. We are delighted to be able to offer this new service. We want to create a capsule skincare range especially for you and we want you, with our guidance, to formulate your own signature scent from our very best essential oils. These sessions are around 2 hours. Working 1-1 with Amanda, you will discuss your skin’s needs and together we’ll create a signature scent that only you will have. We’ll keep a record of the recipe and as you run low on products we’ll supply them smelling exactly the same. Depending on your skin, we’ll plan to include a cleansing oil, face cream, facial serum, aromatic water blend, body oil or body lotion. We'll tailor make the products specifically to meet the needs of your skin. There are very limited sessions of 4 per month and cost £1000. To book, please phone the shop. Relax in the Blofeld chair whilst we work on your products. If you’re travelling by train from London or further afield to visit, if you let us know we’ll arrange a taxi to collect you from the station. Our products are distilled from the flowers we grow..